The project on Northport’s preschool-through-12th-grade campus is the first time the state has funded the installation of a wood pellet boiler in a public building and is part of a larger effort to promote the wood-energy industry in Washington. After looking at a number of schools in the state, the WSU Energy Program analyzed and recommended the Northport site, and the Department of Commerce’s Energy Division allocated state and federal funding for the project. Commerce, WSU Energy Program, and DNR are all on the Washington State Wood Energy Team, which works to develop biomass energy projects that complement the state’s forest restoration goals. For the school district, the project came at the perfect time – one of its diesel boilers was failing, requiring constant repairs. Northport is in Stevens County in Northeast Washington. Baribault said the pellets will initially come from an Idaho supplier, but he hopes that as the bioenergy industry takes off in Washington, there will soon be a supplier even closer to home. 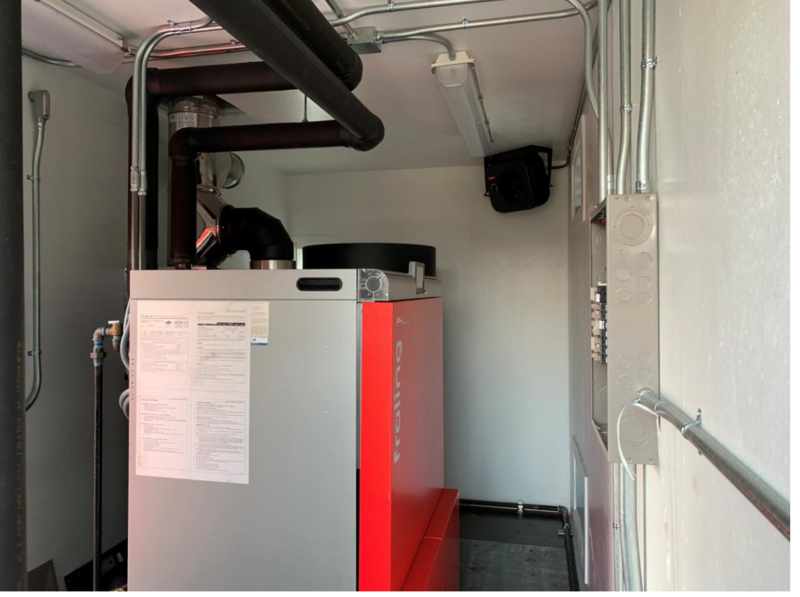 The new biomass boiler was installed in a modified shipping container off-site to reduce construction costs, and crews are completing the final installation this week at the school. Wisewood Energy, a Portland-based biomass energy developer, led the project’s construction and final design. The boiler project is also part of this year’s National Bioenergy Day, sponsored by the U.S. Forest Service and the Biomass Power Association. Across the country today, communities are highlighting the ecological, social, and economic benefits of a locally sourced renewable wood-energy industry. For more information about the Northport boiler project, visit DNR’s Ear to the Ground blog.